The Mahanayake of the Malwatte Chapter, Most Ven.Thibbotuwawe Sri Siddhartha Sumangala Thera yesterday presented the scroll bestowing the honorary title of ‘Sasana Deepana Abhimani Sri Lanka Janaranjana’ to Housing, Construction and Cultural Affairs Minister and UNP Deputy Leader Sajith Premadsa in recognition of his services to the nation and the Buddha Sasana. 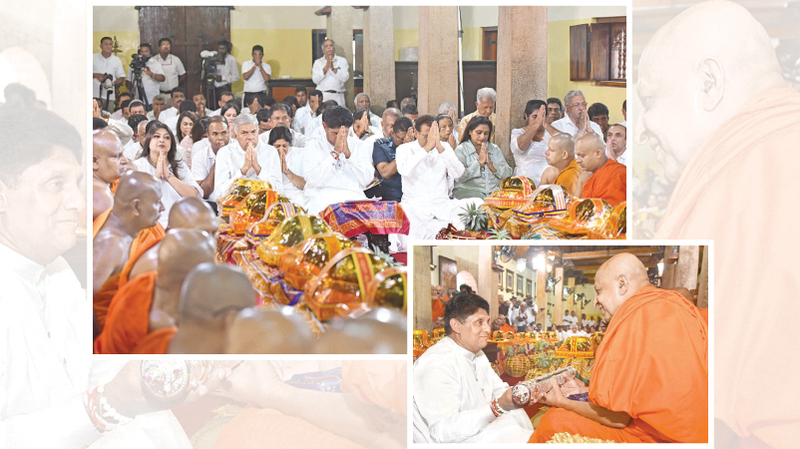 President Maithripala Sirisena and Prime Minister Ranil Wickremesinghe too participated among others in the event held at the ‘Mangala Uposithagaraya’ at the Malwatte Maha Viharaya in Kandy. Pictures by Sunil Gunawardena, Kundasale Group Corr. The Malwatte Chapter of Siyam Sect yesterday bestowed the honorary title ‘Sasana Deepana Abhimani Sri Lanka Janaranjana’ on Sajith Premadasa, the Minister of Housing, Construction and Cultural Affairs and Deputy Leader of the UNP in recognition of his enormous service to the nation and the Buddha Sasana. The Mahanayake of the Malwatte Chapter, Most Ven. Thibbotuwawe Sri Siddharta Sumangala Thera with members of the Karaka Maha Sangha Sabha presided over the ceremony held at the Mangala Uposithagaraya of the Malwatte Chapter. President Maithripala Sirisena and Prime Minister Ranil Wickremesinghe too were present among others. Anunayake of the Malwatte chapter Ven.Niyangoda Vijithasiri Thera started the proceedings by reciting ‘Panchaseela’ and then in his ‘Anusasana’ went on to describe the reasons th Malwatte Chapter of the Siyam Sect decided to bestow the honorary title on Minister Premadasa. The Thera noted that the title was bestowed on the Minister in recognition of his service to the Buddha Sasana, the nation, the culture and heritage of the country and especially his commitment to uplift the poor and the underprivileged. Anunayake of the Asgiriya Chapter Ven. Wendaruwe Upali Thera, Chief Incumbent of the Mahiyangana Raja Maha Viharaya Ven.Urulewatte Dhammarakkitha Thera, Ven.Medagama Dhammananda, Ven.Naranpanawe Ananda Thera and Ven.Murudeniye Dhammarathana Thera participated representing the Asgiriya chapter. Minister Premadasa’s mother Hema Premadasa, his wife Jalani Premadasa, relatives of the Premadasa family, Ministers, provincial politicians, government officials participated.